With everything going on at work currently I totally feel left out from all the fun baking a myriads of cookies and sweet somethings. I can’t believe I’ve only made four different sorts of cookies and not only is time running out, but my little cache is exposed to edacious vandalism on a daily basis. In the past I substituted the ground peeled almonds with ground hazelnuts for a change and dipped the ends in melted milk chocolate, which produces a more rustic variation – delicious nevertheless. Blend together the almonds with the flour, sugar, butter, egg yolks and vanilla seeds and knead well to form a dough (our KitchenAid mixer does a perfect job here, really no need to knead the dough with your hands – unless you’re into getting messy with your hands :) Shape four equal sized rolls and chill for at least an hour, wrapped in plastic. Preheat the oven to 175°C (347°F). Cut rolls into 15 to 20 equal pieces each, depending on whether you’re going for smaller or bigger crescents. 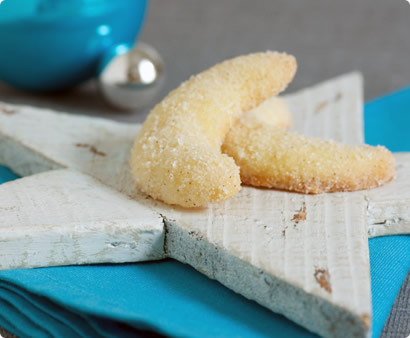 Form pieces into small rolls with pointy tapering ends and bend these into crescents. Depending on your ambition, this can be rather time-consuming: Each year I try to perfection my way of forming crescents, the ultimate goal are absolutely equally shaped little beauties. Although I came pretty close to the mark this year, hasn’t each little crescents deserved its own personality? Note: A good way to always have some vanilla sugar readily available: Keep caster sugar and one (or more) scraped-out, almost empty vanilla bean (could have been used for something else) in an air tight jar, after a few days you’ll enjoy your own vanilla flavoured sugar. First seen on Jamie Oliver’s show some years ago, but probably not his invention, ‘don’t know. Required time: prep. : 5 min., chilling: 1 hour or over night, baking time: 10-15 min. delicious, delicious, delicous! Complements Chef Tony. Very nice photo , and interesting recipe quite different from the french recipe We generally dont put egg yolk ! and don't make crescent too, I like your way of making them ! Only if you are curious, you can see the look of the traditional french one ! I am waiting for the aromas to fill my house too. I have heard that about vanilla sugar. In Slovakia, you can get it in these tiny little sachets really cheap and it is very strong! I don't know how they produce it, but I doubt it would be with a proper vanilla pod. As usual, great pix and a delicious sounding recipe. Yum! Article is on 16 dec, food photography. I was planning to make some very soon and seeing yours make me wanna make them as soon as tomorrow. Very nice looking "cookies". They sound lovely. By the way, the vanilla sugar thing is definitely not jamie's invetion - my mother taught me to do it over 30 years ago now! I was wondering how much vanilla sugar comes in a standard packet? As my Omas recipe for Stollen just says 2 packets???? oh and nicky, i'm flying on friday so you know what that means .... a reply to you soon. Thanks for your kind feedback, hope you all are having a wonderful Christmas season :) With lots of cookies! Hi Mercotte, I know - there are countless variations of Vanillekipferl recipes :) Of course I had a look at yours (I like the tiny paper cups! ), I always thought that they got their name “Kipferl” because of their crescent shape? Hi Dreska, I know those little packets, but as far as my knowledge goes, they don’t contain real vanilla (they include something called vanillin sugar, which is synthetic). Meanwhile various shops also sell these sachets containing real vanilla sugar, but its much cheaper in the end to “produce your own” with used vanilla beans. Cindy, That’s the danger in browsing food blogs – I want to make ALL of the wonderful cookies (and eat them, too)! Hi Clare Eats, Thanks :) Just checked my spices cupboard to see if I could find one of those packets… one that’s unhappily waiting to be used; I didn’t buy them anymore after I started preparing my own vanilla sugar. But I wasn’t successful… The internet didn’t help either… My guess would be that one packet contains around two teaspoons of vanilla sugar or vanillin sugar. But that’s just a guess! Dear Maria, My package is also on its way ;) Holidays will start within the next days, so be prepared for more emails from my end of the line, too! There is about a tablespoon of vanilla sugar in one packet, to the best of my knowlege. Great pictures on this site...I am a first time user and I know that I will be using some of these recipes very soon! my mother was from Austria and she made Vanillekipferl every year, instead of egg we have been putting in 1level teaspoon of baking powder and 3 to 4 Tablespoon of ice water to the flower mixture. Vanille-sugar a must. I am teaching my children now. They are a lot of work but well worth it . I can't make enough everybody loves them. the cresents are delicous! i made them today for a project! Good recipe. Nearly like what my mom makes. Had to pt some extra cold water and an extra yolk in, the dough was very crumbly and didn't stick together otherwise. The best home-made vanillekipferl I have ever tried! I also made an extra-patch of gluten-free vanillekipferls and they turned out delicious as well. So this recipe is definitely a keeper.